"Our clear road captain is Rogers, who together with Kreuziger and Basso represent a very strong supporting trio in the mountains. I’m convinced that we have a really strong squad around Alberto." Giro d’Italia is fast approaching and represents the first, major goal of the season for team leader Alberto Contador, who will receive support from the likes of Kreuziger, Basso and Rogers in an attempt to claim the overall win at the end of the 3,482km Grand Tour. At the start in Sanremo, Tinkoff-Saxo lines up Alberto Contador, Roman Kreuziger, Michael Rogers, Ivan Basso, Sergio Paulinho, Manuele Boaro, Matteo Tosatto, Christopher Juul-Jensen and Ivan Rovny. Last week, Alberto Contador talked in depth about his form, this year's parcours, his opponents as well as the strong squad that will support him during three demanding weeks. According to leading sports director Steven de Jongh, Tinkoff-Saxo fields a competitive and driven team with the ability to support captain Alberto Contador in diverse terrain in the search for the overall win. “We all know that a grand tour is long and a lot can happen over the course of three weeks. However, if Alberto stays safe and fresh, he can play a main role in the GC. Alberto and the boys had a really productive altitude camp on Teide, where Rovny and Kreuziger also went earlier. And following the Ardennes Classics, I can see that Roman is in great form. I’m confident that the guys stand fully prepared on Saturday”. Asked about his view on the daunting three-week race, Roman Kreuziger comments that his main objective is to support the team captain. “I have raced the Giro twice, in 2011 and 2012, and it's a race I really like because of the country and its people. Although it's less stressful than the Tour de France, it isn't any easier! The climbs are shorter but they are steep and intense. I feel that I have the shape required to help Alberto in these climbs and I look forward to the start on Saturday. I feel excited to take part in such a prestigious race with such a great team." Tinkoff-Saxo’s road captain Michael Rogers underlines that preparation is pivotal with key challenges such as Passo del Mortirolo, Colle delle Finestre and the long 59.2km TT on the menu during the 3482km route of this year’s 98th edition. “To fulfill my goal of arriving at the Giro d’Italia with a balance of physical conditioning and mental freshness, the Tinkoff Saxo coaching staff and I decided to put greater focus on quality blocks of training, rather than the traditional early season competitions. Collectively as a team, we have done our best - both on and off the bike - in preparation for the Giro. I feel we have a well-balanced team, and we look forward to the numerous challenges that lay ahead in the next three week”, comments Michael Rogers, who returns to Giro d’Italia after having scored two memorable solo wins in last year’s edition. With eight participations and two overall victories in 2006 and 2010 as well as six stage wins, Ivan Basso comes with great memories and experience from the Giro. 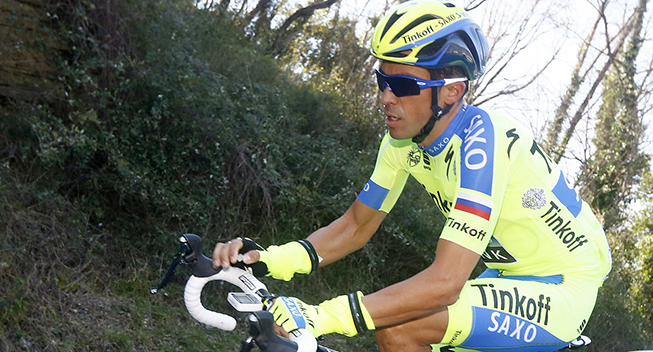 This year he’s not gunning for the GC, but underlines that he has prepared as if he were. “Alberto is in great form himself and the entire squad is in the best shape possible. I think the quality of work at the training camp was excellent, we rode a lot, we talked a lot and discussed at length our approach. Our leader is the world's best rider and that fact gives confidence to the rest of the squad. The Giro is always difficult and there will never be an easy moment. The first days will be difficult including the team TT. Then, after the fifth stage the climbs start and we will always have arduous days. Simply said, the Giro is always complicated”, finishes Ivan Basso.